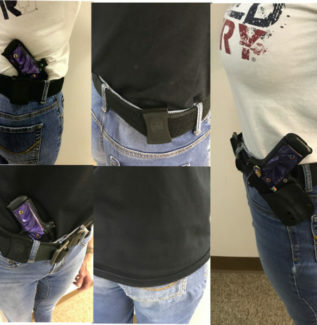 In the waistband (IWB) Concealed Carry Holsters for both men and women are the most comfortable holsters you will ever wear. IWB holsters are meant for deep concealment. These holsters hold the firearm tight to the body to prevent printing while providing maximum comfort. 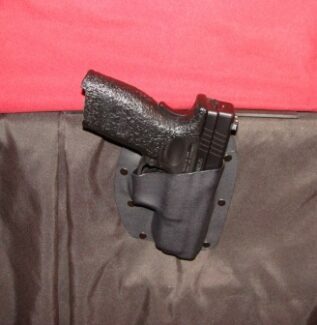 Our IWB holsters are a combination of leather & Kydex with 2 clips that attach to either the pants or the belt. 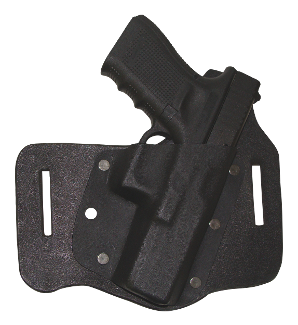 All of our IWB holsters are manufactured with the combat cut standard. The gun?s position in the holster is standard with a 15 degree cant. This means the gun will be in an ergonomic position for your hand and arm as you reach back to draw your weapon. Additionally, this brings the hand grip of the gun towards your back rather than pointing out for others to see outside your shirt. 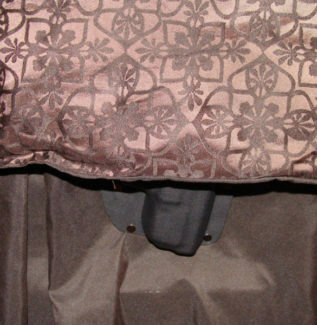 Our leather also has adjustable holes so you can change adjust the cant and make it the perfect fit for you. 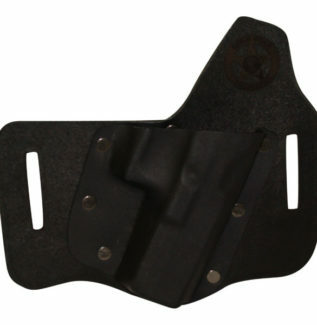 The Kydex for the IWB holster, as with all our holsters, covers the trigger, the front sight and muzzle of the handgun. All of this provides rapid draw and maximum concealment. 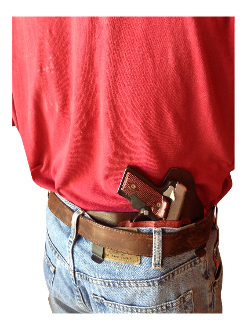 Most people find the most comfortable position to wear their IWB Holster is the 4-5 o?clock position. 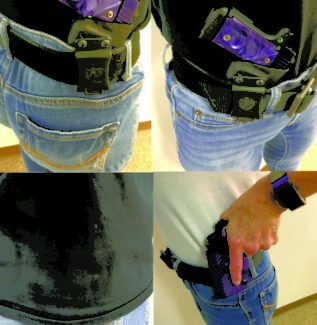 The easiest way to achieve this placement is to place the holster before you put your pants on, with the first clip at the side seam of your pants. 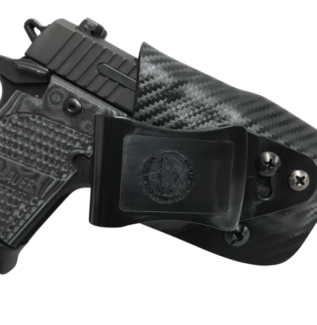 We ordered the custom in the waistband holster with camo/military type pattern for our Smith Wesson 9 mil and it has worked out fantastic! Had previously ordered our sons through here also and will be ordering more! I bought this holster for my Sig 1911 and I love it. So much more comfortable and easier to use than any other holster I’ve every tried (and I’ve tried a lot before I got this one). I would highly recommend this holster and Gold Star Holsters. The best tuckable IWB holsters for the money. That includes both that I purchased. I recently purchased this IWB holster for a Ruger SR9C that I just bought. When I picked it up, the gun fit perfectly in it. The problem I ran into, which was my own fault, was that when I tried it out at the shop I did not have a round chambered in the gun, and this model has a rather large “chambered indicator” that sticks up on the top of the slide. With a round chambered it would not fit correctly into the holster. A simple short trip to the shop and 5 minutes later Trevor had the holster modified to fit my gun perfectly. Like I said, excellent holster. But even better customer service! Very happy with all 3 holsters i have. Great customer service. Very helpful. The IWB holster is the most comfortable IWB i’ve ever used. It fits well and the tab on top makes for a sure grip of the handgun when reaching behind. When I first talk to the owners, I told them how I wanted my holster. They explained in detail how the holster is made and how to use it. They were only selling me a 45.00 holster but treated me like I was giving them a million dollars. These people care and understand the needs of people who support the right to carry and bear arms. Defiantly American Craftsmanship at its best. Very pleased with both in the waistband holsters I have purchased. Also the pocket holster. All holsters are well made, secure the firearm securely and very comfortable to wear. Will continue to purchase future holsters from Gold Star. This is my favorite of all my IWB holsters. The cut on the leather protects the gun slide release from digging into my skin but allows my draw hand to get to the gun easily and quickly. Very comfortable, very well made. Excellent fit of kyodex to my gun. 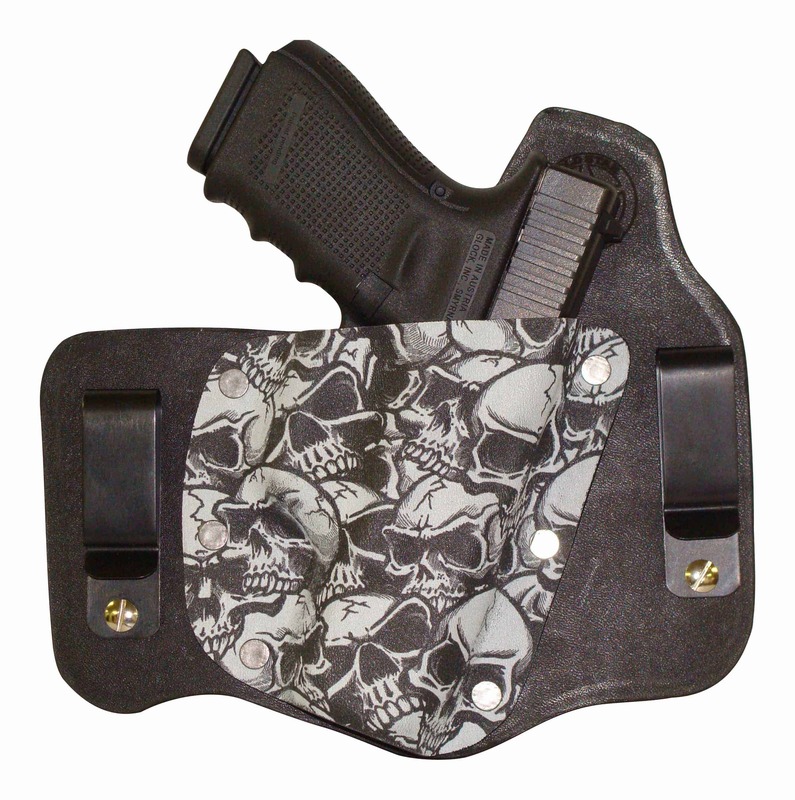 This holster fits very well and remains very concealed. Its extremely comfortable even when sitting in my truck or on my motorcycle. Good stiff leather and excellent kyodex fit to my gun. These are some of the finest holster’s I have ever purchased. A really thought out holster, very comfortable, once it’s broke in you won’t even know your carrying. And great people to deal with on top of that. The holster I purchased from Gold Star is my main carry holster, therefore it gets a lot of use. It is very comfortable and secure. I have no problems with drawing, and no problems with the firearm slipping out. My only slightly negative view of this holster is that it doesn’t conceal the weapon as good as some others I have. When I discussed the effectiveness of the conceal with the makers I was informed that the holster forced the grips of the weapon to be pulled against the wearer’s side, however on my side it protrudes out away from my body no matter what angle I wear the holster at on my waistband. To compensate for that I simply wear really baggy clothes or a jacket over it to conceal its shape better. After all I am carrying a compact .45 acp so there will me some evidence that it is there no matter what. Overall, I am very pleased with this custom holster, even though I was leery to buy one at first. I would recommend them to anyone who is needing an every day carry holster. The quality of this IWB holster is second to none, and I have a couple different IWB holster’s. I was surprised how comfortable it is once I got it broke in, which took a couple days of constant wearing. Ordered on Friday morning, and it was shipped Friday eve, arrived Monday afternoon, talk about service. No problems while riding my hardtail either, weapon stays put. This truly is an outstanding CCW holster for my Kahr CW40, thanks man, job well done. I will be back. Just returned from A camping trip and my Holster was on the doorstep. I have had it on for about 1 1/2 hours. This Holster is the most comfortable one I have by far! I have other IWB Holsters, But this tops them right out of the box. Looks like another is in the future. This Holster is for my Sig SP2022. Less than 1 week delivery. Wanted to thank Trevor for a fantastic product. Very good material and workmanship. Only 2 days from order to completion. I really do not know how he could have done a better job. I WILL be back for any future needs. I have been a police officer for seven years and have not been able to locate a comfortable concealed holster to wear off duty. I have had my IWB holster from Gold Star Holsters for about two weeks now and could not be more pleased. It is so comfortable to wear that I do not even notice it during my everyday activities. I have been recommending Gold Star Holsters to everyone at my department. 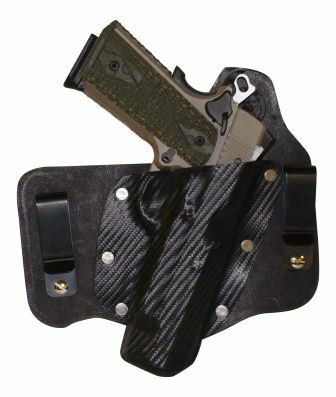 I just purchased this holster for my Taurus 605 revolver and I can already tell I am going to love it. Being left handed, it is almost impossible to find a good holster for and of my handguns. I contacted Trevor about this and he took great care of me. The turnaround time is amazing, and I could not be more pleased with the quality, ease of use, and overall appearance of this holster. I WILL be ordering one for my Ruger P95 very soon. Have tried paddle type’s and other holsters, but were very uncomfortable. 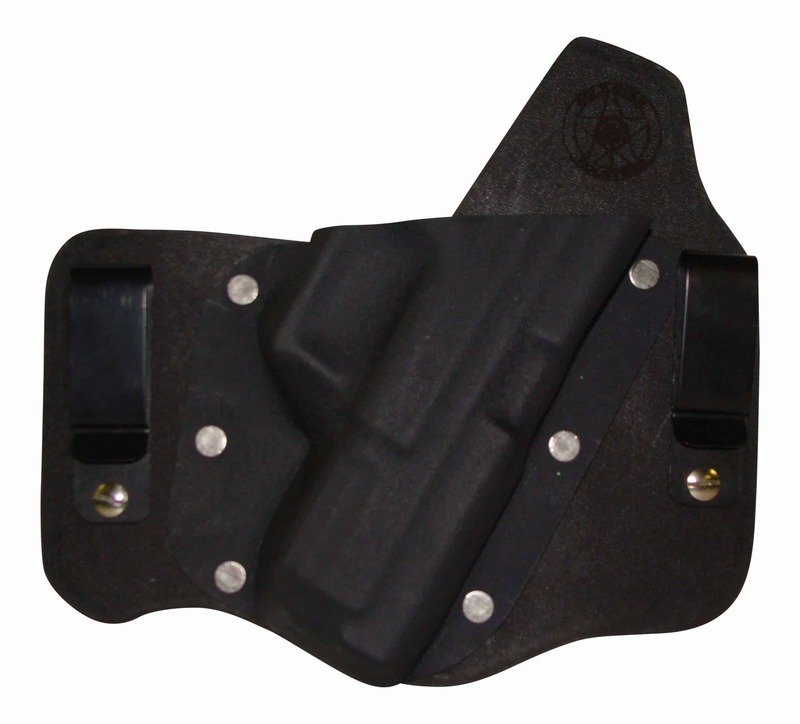 Then I got a Goldstar waistband holster, very comfortable. When I travel my gun does not dig into my side and I don’t have to keep adjusting it. Easy to remove my gun when needed. Would recommend this holster for everyone with conceal carry. And that they donate to wounded warrior is a plus. I have had my Gold Star (inside waist band) Holster for over two weeks and have worn it every day morning to night. I have used other holsters but this is the one I will be wearing from now on. It has excellent quality and workmanship and is extremely comfortable to wear. I am on the road a lot and from time to time, I would have to reposition other holsters to find a semi-comfortable position. Not this Gold Star; Put it in position when you get dressed and you won’t need to touch it again. The retention is perfect; stays put regardless of what I’m doing put is easy to draw. The price is right and I had it in my hands in three days (not 45 or 60 days). I could not be more satisfied. After years of buying holsters I finally found the right holster. I have tried many holsters over the years but now I have the most comfortable holster to carry concealed. I ride a Harley almost everyday or drive a Jeep and now I am comfortable and not worring about my Glock profiling and almost forget I am carrying. My fianc’e just got her concealed and we have ordered her a purse holster and its pink. She is excited and I feel better that she will be safer with the holster. Thanks for a great holster and I am spreading the word to my friends. I bought 2 CCH holsters. The one for the LC9 fits great and has a poitive snap when I put the gun into it. The same for the S&W J frame. I love them both, great comfort. Thbe one for the J Frame won’t fit my 360PD, but it has a HiViz orange dot front sight. I guess that is why they are custom fit. All and All they are excellent, and just as comfortable as my Galco King Tut. Highly RECOMMEND and can’t beat the price. Feels more secure! I got a set of Polymer In-The-Waistband clip for my IWB and they are great! Amazing holster, perfect fit and so comfortable, I forgot I was carrying! Thank you, great job on the add ons, has perfect tension. Carry is a Sig P365 foxtrot flashlight 12 round extended magazine. I am wearing a tight shirt on a not so trim guy. This is definitely best hoster yet!